Chengdu is a city brimming with a strong leisurely ambience with Jinli Street as the typical representative. The street is located to the east of the Wuhou Temple of Chengdu (the most famous Three Kingdoms period (220 - 280) relic museum in China). It is recorded that as early as the Qin Dynasty (221 BC - 206 BC), Jinli Street was the most famous place for baldachin - a rich, ornate cloth. And it was one of the busiest commercial areas during the Shu Kingdom (221-263). Hence, it is known as 'First Street of the Shu Kingdom'. In order to reclaim its prosperity of former days, it was restored with contributions from the Wuhou Temple and was opened to public in October of 2004. Since then, visitors from all over China and abroad gather here to relax, admire the traditional-style buildings, and taste some local snacks. At one end of Jinli Street is an imposing archway with 'Jinli Street' carved on it. From there the lane, paved with green flagstones, winds through Chengdu for a length of 350 meters (382.8 yards). By combining the culture of the Three Kingdoms Period with the folk customs of Sichuan, the buildings on both sides including tea-houses, stores and hotels, are modeled on the architectural style of a traditional old town in western Sichuan Province from the Qing (1644-1911) Dynasty. The wooden steles and the brick-walls exhibit an ancient charm. Strolling down the narrow street, you will find yourself surrounded by old-world stores selling Shu Embroidery, lacquer products, folk handicrafts, curios, or calligraphies and paintings of celebrities. All of these stores have their unique style but also have one thing in common: no matter how busy the place is, the stores are peaceful and relaxing. You can browse leisurely or purchase some souvenirs for your friends. Most of the special local products can be found here. Outside the stores, the stalls are busier but equally attractive. You can find folk artisans putting on funny shows such as a Shadow Puppetry show or a hand puppet show. Some traditional arts such as Paper-cut and clay figurines made by the skilled craftsmen are sold here. They are so delicate and life-like that you won't be able to resist buying some. From these artworks you will get a taste of the true life of the local people and find some reminders of China's past in the modern city. In the middle of Jinli Street, there is a wooden stage which looks like an ancient pavilion. It is used from time to time for performing classic Sichuan Operas. You can enjoy folk music along with the actor's beautiful, quick costume and make-up changes. The actors' perfect performances will wow you. Open-air movies are also shown in front of the stage. There are also some other performances in Jinli Street such as a traditional clothing show, sounding night watches, and carrying bridal sedan chair and bamboo chairs show. Another interesting performance is the local wedding ceremony show in which visitors may participate. Lovers can also have a unique and traditional wedding ceremony here. On traditional festival days, Jinli has some theme activities: lantern exhibitions on Lantern Festival, zong zi (glutinous rice wrapped to form a pyramid using bamboo leaves) eating competition on the Dragon Boat Festival, appreciating the glorious full moon on the Mid-Autumn Festival and so on. Despite the traditional atmosphere here, you can also sense something fashionable. There are many cafes and barrooms here - including Starbucks. They blend modern elements into the old town harmoniously. It's enjoyable to sit on a wooden bench with a cup of delicious coffee. When you reach the end of Jinli Street, you'll be tempted by the aroma of delicious local snacks. The citizens of Chengdu are born epicures and they are particularly fond of dining. Here there are many restaurants as well as sidewalk booths offering local snacks that will make your mouth water. San Da Pao is a distinctive snack of Sichuan Province and is made from sticky rice, brown sugar, sesame, and beans. And the sweet dried persimmon here is also considered a unique reflection of Chengdu. Some other local snacks include rice glueballs, wontons, and boiled dumplings. Of course, the famous 'Dishes of Three Kingdoms' is also delicious and waiting for you to enjoy. Take Bus 1, 57, 82, 334, 335 or 1126, and get off at Wu Hou Ci (Wuhou Temple) Station. 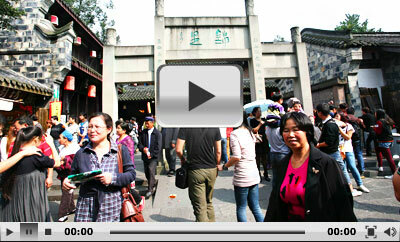 Can you walk from Chengdu Wuhou Temple to Jinli St.
How long does it take? What is the distance? They next to each other. just in 2 minutes!! Which metro line or best way to get from hotel Chengdu Wenjun Mansion Hotel to Linli Street? You must refer to Jinli Street. From your hotel, walk southwest around 750 meters to get to Qingyanggong Bus Stop. Take public buss no.82 to Wuhouci Bus Stop. After arriving, walk north around 500 meters to find the destination. what time usually the shops on Jinli street open and close? Generally speaking, most shops on this street will open around 09:00 and closed at 22:00.
what's the most convenient way to get to Jinli street from Leeden Hotel? We have 5 persons. Does the regular taxi accept 5 passengers? Thanks. The most convenient is to take the bus No.8 at Hongxinglukou, about 50 meters from the hotel. And get off at East Street, Zhuge Liang Memorial Hall. Then walk about 750 meters to the ancient street. The ticket fare is CNY2 per person and the duration is about 1 hour. You need to take two taxis because one taxi can hold 4 passengers. The fee is about CNY30 per taxi.